A company is only as good as the team it employs. 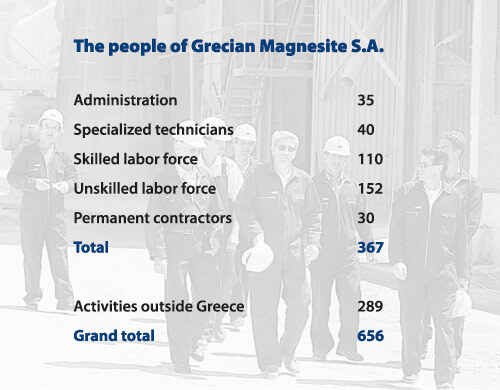 At Grecian Magnesite we have quality people for all facets of our activities. Our top priority is a safe workplace and a healthy environment in all work sites. Encouraging our people to realize their personal and professional potential is central to our culture. We aim to create a stimulating work environment that nurtures talent and creativity, challenges our people to develop skills, and recognizes achievements. We value diverse backgrounds and want to ensure our people can balance work and social commitments. We offer attractive incentives and career development opportunities to keep employees engaged and motivated. These measures explain the long tenure of our employees. We feel satisfied knowing our people keep their experience and skills working, to provide the best products and services for you.